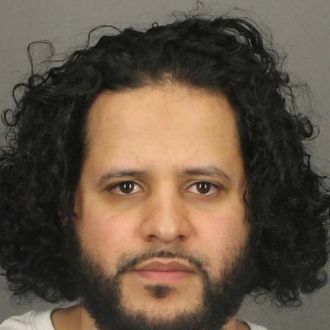 On Thursday, 32-year-old Mufid Elfgeeh of Rochester, New York, was handed the longest prison sentence of any American convicted of supporting ISIS so far. He faces 22 1/2 years in prison, followed by 27 1/2 months of federal probation, for attempting to recruit fighters to join the militant group in Syria. Elfegeeh pleaded guilty to recruiting two men on behalf of ISIS in December. According to Reuters, he bought them “a laptop computer, a high-definition camera, and an expedited passport” for their trip to Syria. He also “activated a network of Islamic State sympathizers in Turkey, Syria and Yemen who could facilitate their trip.” Despite Elfgeeh’s efforts, neither recruit made it to Syria. Elfgeeh isn’t the first American to be charged with offering material support to ISIS. Last summer, a New Jersey man was arrested in Jordan for his alleged plan to form a “small army” of ISIS supporters in New York and New Jersey, and a 17-year-old was sentenced to 11 years in federal prison for pro-ISIS activity online. On Thursday, an Arizona man was convicted of conspiring to support ISIS, and on Friday two more men in unrelated cases pleaded guilty to recruiting for the terrorist group as well — all three have yet to be sentenced, but their sentences could be even longer than Elfgeeh’s. Elfgeeh reportedly disavowed ISIS in prison, saying he couldn’t support the group after seeing its members commit beheadings and other violent acts. He was allegedly an ISIS fan in the first place because he saw the group as a threat to Syrian president Bashar al-Assad. According to William Hochul Jr., the U.S. attorney for western New York, Elfgeeh’s disavowal is important because it destroys ISIS’s “false narrative that everyone is in favor of them.” The group has long used social-media platforms such as Facebook and Twitter to recruit abroad, but recent crackdowns have put a dent in recruitment numbers.